games, coloring pages, activities, recipes and more! Presents are an exciting part of Hanukkah. But there are other exciting things about Hanukkah. Like getting your temple back and oil that lasts longer than it is supposed to. When you print out this free Dot-to-Dot, you can celebrate the excitement of the Festival of Lights and share it with everyone around you. Click on the thumbnail to download the dot-to-dot puzzle PDF file. 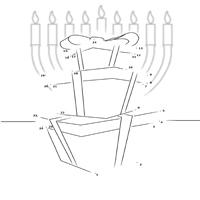 What is the Difference Between a Hanukiah and a Menorah?